Today, Warner Bros. Interactive Entertainment, TT Games, The LEGO Group, and Lucasfilm announced the much-anticipated—or at least casually expected—LEGO Star Wars: The Force Awakens video game. According to Deadline, the game will allow players to “recreate the action sci-fi film and introduce new gameplay mechanics to build, battle and fly through the galaxy far, far away.” Presumably, this means that players can finally create some person or creature willing to hug Chewbacca when he’s sad, since J. J. Abrams didn’t care enough to do that. The game also will include new story content linking Star Wars: Episode VI—Return Of The Jedi to Star Wars: The Force Awakens. Though the game will probably stop short of answering questions about Rey’s childhood (those revelations likely will be saved until Episode VIII), perhaps LEGO Star Wars: The Force Awakens will reveal how Poe and BB-8 got together, whether Supreme Leader Snoke is actually three stories tall, or anything at all about Captain Phasma. Also, if someone could explain what Lobot’s been up to for the past 30 years, that would be great. 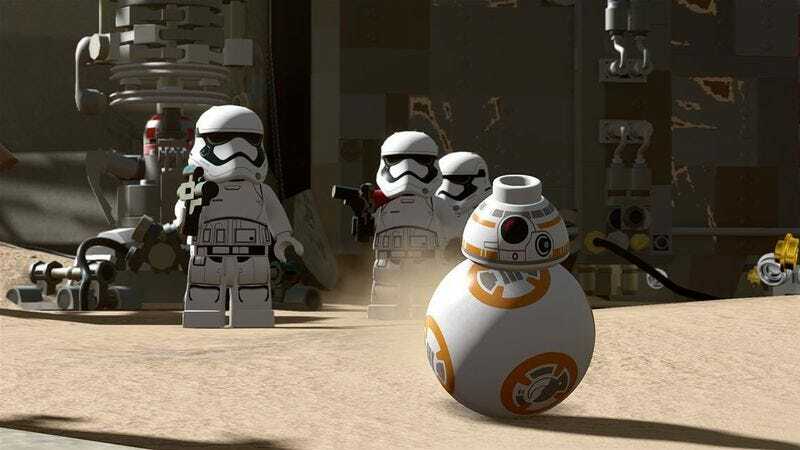 Below you can watch a preview for LEGO Star Wars: The Force Awakens, which launches on June 28.